After I wrote my post, Why I Didn’t Love Santorini, many people ask what islands they should visit instead. 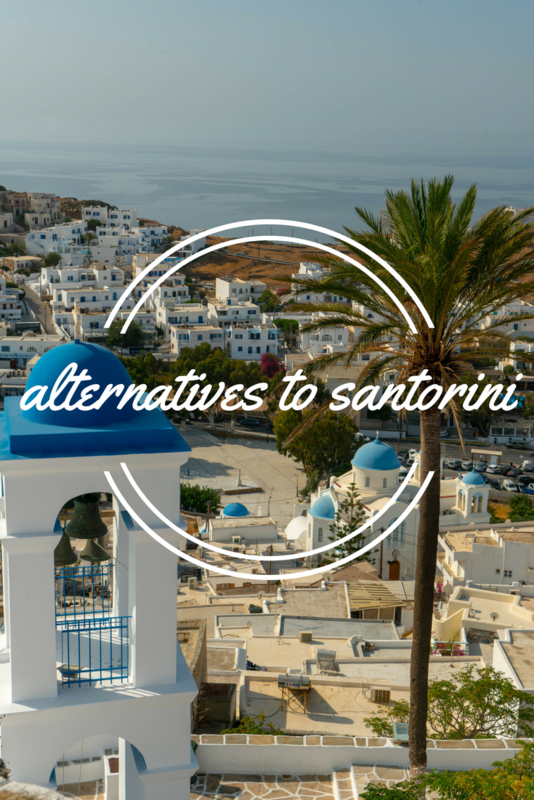 So I am giving you my five alternatives to Santorini. A few of these islands are close to Santorini and a few are closer to Athens. Each of them has comparisons to Santorini in some way and all of them are cheaper than Santorini. Paros is one of the large Cycladic Islands and is accessible by ferry daily from Piraeus port in Athens. Do not confuse it with Poros, which is an island closer to Athens. Paros used to be known for its marble quarries. There is something for everyone on Paros. 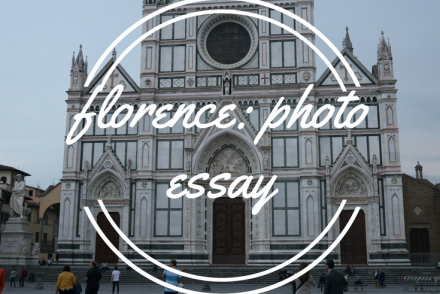 You can visit historic sites, get a tan on the beach or go windsurfing! It is a great alternative to Santorini because the villages have a similar style and since the main village, Parikia, is flat it is more accessible than Oia on Santorini. Visit Panayia Ekatondapiliani Cathedral – This is also known as the church with 100 doors. It is very beautiful and there are tons to see. Old Port of Naoussa – This is one of those iconic Greek places where cafe tables meet the sea! Wander Parikia Town – This is one of the most beautiful towns on the islands I have seen. Tons of shops and restaurants to see as well. Go Windsurfing – For the more adventurous, Paros has lots of wind making it a top spot for windsurfing. Visit Golden Beach – One of the most beautiful beaches on the island and it is large. You might even be able to see the windsurfers from here. Find a hotel on Paros, click here for Booking.com or Hotels.com listings. 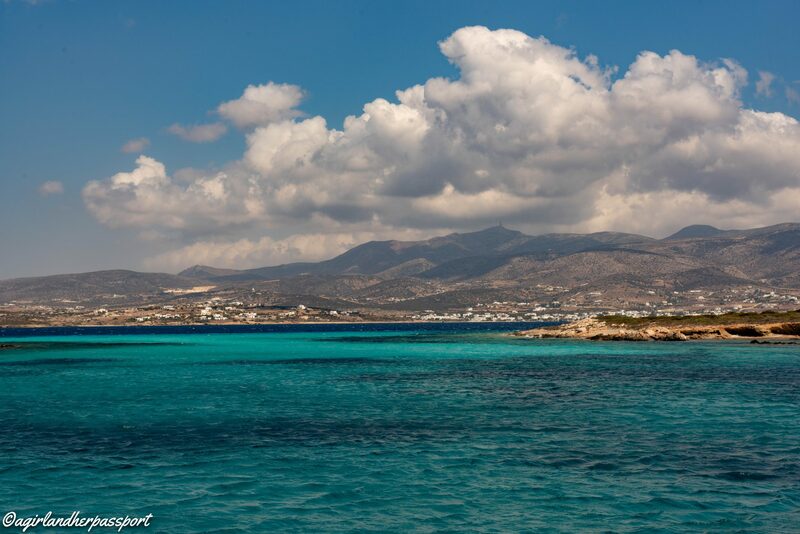 Right next to Paros is Naxos, the largest of the Cycladic Islands. Naxos has tons of beautiful beaches. It is also extremely family friendly. You can fly to Naxos as well as take the ferry. I like Naxos better than Santorini as it is also flat at the port and the Chora is right next to a great beach. It means you don’t have to walk far for dinner or rent a car. Visit the Kastro – Located right in the Chora, the 13th century Kastro is an ancient castle with three gates. Two of those gates are still in existence. The Kastro has several things to see inside including the Archaeological Museum. See the Temple of Apollo – This is hard to miss as it sits at near the entrance of the port. Walking out to it is easy and offers great views of the sea. Take a Dip at Agios Prokopios Beach – This great beach is right next to the Chora and has plenty of cafes and bars to hang out as well. Go to the Eggares Olive Press Museum – The olive tree and oil are a very important part of Greek life. This covers the whole operation of the press operation. Take a Day Sail – Spend the day on the water and visit places only reachable by boat. 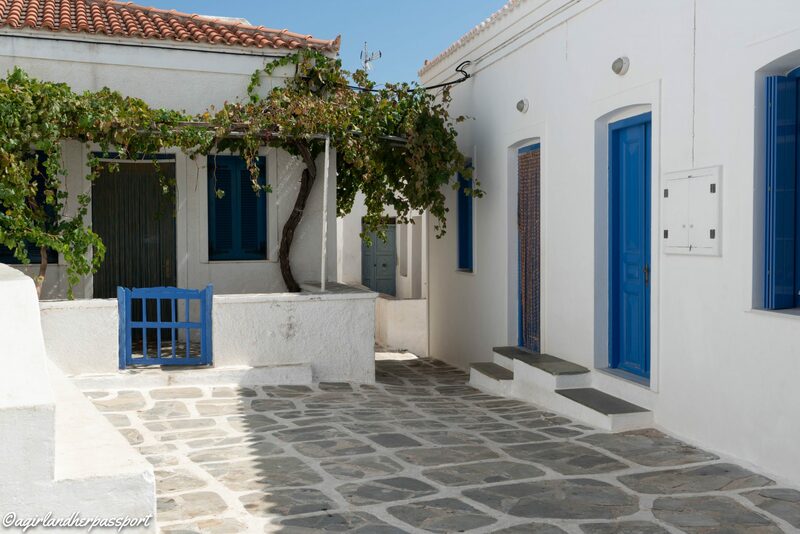 Find a hotel on Naxos, click here for Booking.com or Hotels.com listings. Ios is close to Santorini and in my opinion, has the better sunset! The Chora is up on a hill just like Santorini but without the volcano. Ios has 75km of beaches and is the island to visit if you are wanting to party or even if you are not. Given that parts of the activities are geared to young people, it makes much of the accommodation more affordable than Santorini. Explore Skarkos – This is one of the best preserved ancient sites in the Cyclades. You can see some artifacts from Skarkos in the Archaeology Museum in the Chora. Visit Managanari Beach – One of the most beautiful beaches in Greece. You can take a bus for the day to the stunning beach. Eat at Octopus Tree – This tiny port restaurant has some of the best Greek food on Ios. I recommend the fried zucchini fritters. Here is my list of all the best places to eat in Ios. 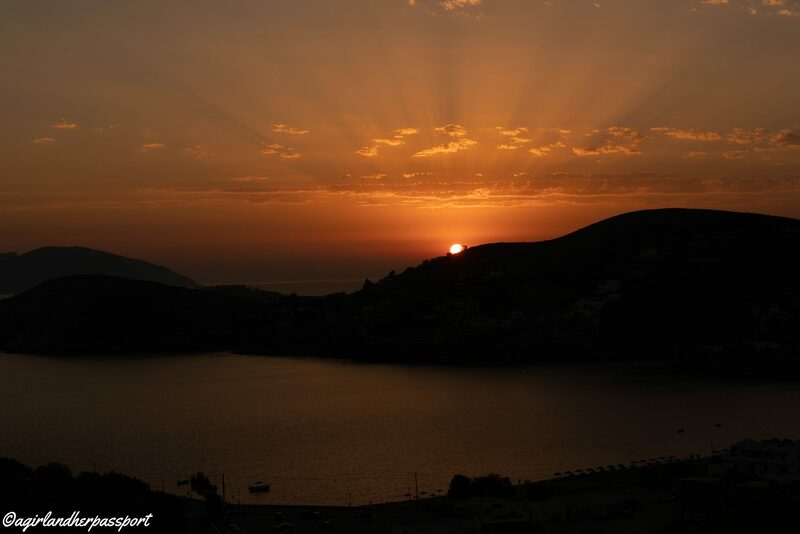 Watch the Sunset from the Liostasi Hotel – The sunset in Ios is stunning and due to its unobstructed views, the Liostatsi is one of the best places to see it. You don’t have to be staying there, just order a drink from their bar. Visit Homer’s Tomb – Homer the poet is supposedly buried on Ios. It is a drive, but worth visiting. The view from here is amazing. Kea is a great alternative to Santorini that is close to Athens. It is also great if you want a less touristy option as it is mostly Athenians that come here. You could come to Kea on a day trip if you wanted to as well. The hilltop village is white and blue like Santorini and offers great views of the island. 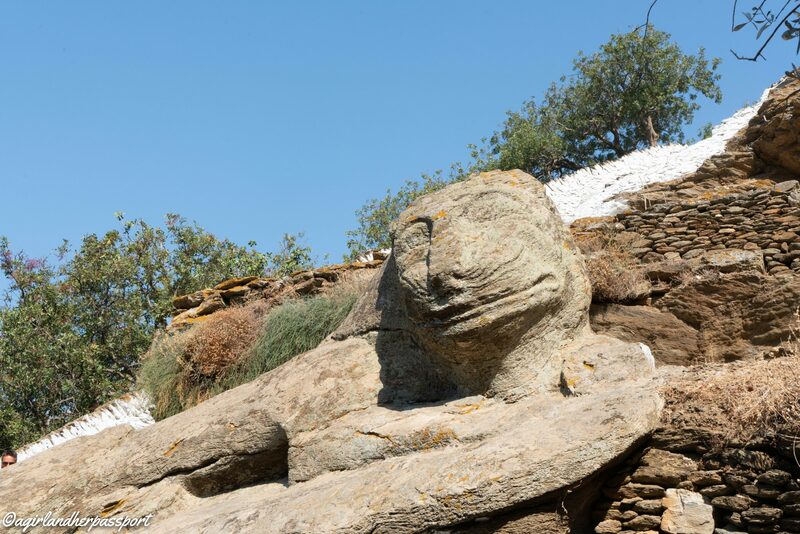 See the Lion of Kea – Located in the hilltop village of Ioulis is a Lion sculpture. It was carved before 600 BC. Visit the Archaeology Museum – Also in the village of Ioulis is the small but great museum. The pottery has feminine features and I have never seen anything like them before. Go Scuba Diving – This is one of the few islands have seen with a dive shop. The waters here were calm making it a great place to dive. Hike to Ancient Karthea – This is a long hike but worth it to see the site and go swimming after. Eat at Bourkarion – This family-owned restaurant is located in the village of Vourkari, which is just down from the port of Korissa. Find a hotel on Kea, click here for Booking.com or Hotels.com listings. Kythnos is also not far from Athens and is another great alternative to Santorini. The island is not too big, but if you really want to explore you will need a car as some of the best places to eat are not in the port. Kythnos still has some of the best food I have eaten in Greece. It is also great as it is not crowded and much more affordable than Santorini. Take a Dip in the Thermal Springs – In the village of Loutra right in the sea is a thermal spring. Eat Mussels at Sofrano – Also in the village of Loutra is the great restaurant of Sofrano and has some of the best mussels I have ever had in my life. Visit the hilltop Chora – This is one of the most charming white and blue villages and reminded me most of Oia in Santorini. Swim at Kolona Bay – This two-sided bay offers great swimming and a stunning view of the surrounding island. There is a narrow strip of beach to relax on, but it is never crowded. Visit Katafiki Cave – This is one of the largest caves in Greece. It was a mine and is now a tourist attraction. Find a hotel on Kythnos, click here for Booking.com or Hotels.com listing. I would never tell you not to visit Santorini, but it is expensive and is very crowded in the high season. If you are only going to Greece once, then visit Santorini for a day or two and then visit one of these great alternatives. There are 220 islands in the Cyclades, so you plenty to choose from! Do you have favorite Greek islands that are alternatives to Santorini? Share with us in the comments! These are all such beautiful places! I love the sound of Kythnos with the thermal springs and caves and bays. The photo is gorgeous too, greek buildings with that colour scheme always look lovely. I totally agree. Kythnos is a hidden gem. Thanks! Greece is so photogenic. Wow, 200 islands! Thank you, Tiffany, for helping to narrow the choices down. It all sounds wonderful, especially the food! And those are just the inhabited ones!! The food is one of the best things about Greece. Wow you’ve seen so much of Greece. I’ve only been to Rhodes, which I love (as long as you avoid the tacky tourist areas. We hired a scooter and drove all over the island and saw every corner of it. My highlights being the open air, butterfly sanctuary in the middle of the Island, which was just stunning. And the small monestry which you had to climb to at the top of a verrrrry big hill. Amazing views up there. I did a sailing trip two years ago and we visited 14 islands! Then last year I spent over a month in Greece. I love it. Rhodes is on my list! We may have another opportunity to see more of Greece, so thanks Tiffany I shall refer to this list when we are deciding where to go! Yay! Let me know where you end up. I have been on the lookout for housesits there but there haven’t been to many lately. Thank you so much for this informative post. i would rather travel to one of these islands with lower prices and fewer people. Kea is wonderful! I hope you get to go one day.